I am no expert in Norse-era clothing, nor have I spent long researching the garments belonging to this period. Also, whilst I do make my own garb, I wouldn’t consider myself a costumer. Everything I made or used was at least loosely based on (or extrapolated from) a period find, however, they may be from different periods or cultures within the overall Norse category. I made and assembled this outfit in 7 days to wear for Fields of Gold 2014 to fit in with Their Majesties Niall and Liadan II’s livery for the weekend. It represents my second attempt at making Norse garb, the first attempt being the Norse Hoods commissioned by Niall and Liadan II. I intend to improve and add to this outfit through time, making it match closer to the valkyrie amulet (Figure 4), which was one of my primary inspirations for this project. For the Serk, I used my existing yellow linen underdress that I wear for my 14th century French sideless sircotes. Eventually, I aim to make a more appropriate Serk with the keyhole-type neckline. 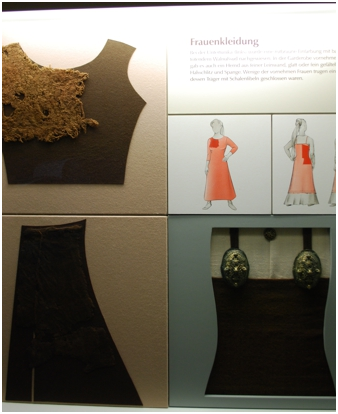 There is a detailed article I found on Viking underdresses for women, published by Hilde Thunem (last updated 10 March, 2014). 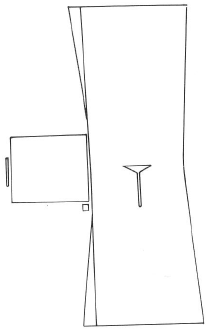 Figure 1: A proposed pattern for a serk, published by Hilde Thunem (last updated 10 March, 2014). My Smokkr is made of a coarse red and white wool, which I won in the early period raffle at GNW 2014. The pattern I used was based on patterns from the Haithabu/Hedeby find (from Germany in an area that was part of Denmark around 900-1000 AD) (The Vikings of Bjornstad, 2009). Figure 2: A photo of the extant Haithabu/Hedeby smokkr, published by The Vikings of Bjornstad, 2009. A pattern based on this extant smokkr can be seen published by Lady Nastassiia Ivanova Medvedeva (Tasha, last accessed December 2014). When I was searching for extant Norse finds, I stumbled across a bunch of Valkyrie pendants from grave finds in Sweden (Historiska, last accessed December 2014). I really like the clothing elements depcited in these amulets, and find the images inspirational. Especially the far left and the 3rd from the left (who doesn’t enjoy spots!). 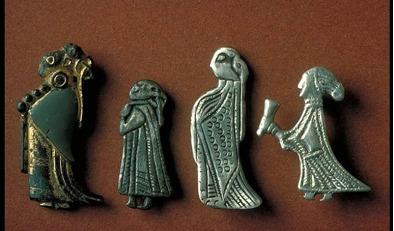 Figure 3: Four valkyrie pendants from grave finds in Sweden, published by Historiska, last accessed December 2014. One thing that appears to vary widely in modern reproduction smokkrs’ is the length. I chose a long length, based on my primary inspiration for my decoration – a Valkyrie pendant from Tuna, Sweden, dated to around 600 AD. This amulet is thought to depict Frigg (The Swedish History Museum, 2011). 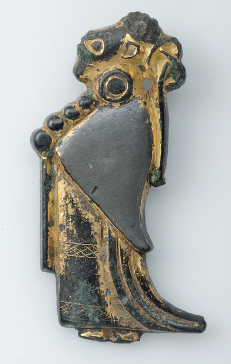 Figure 4: A valkyrie pendant from Tuna, Sweden, published by The Swedish History Museum, 2011. I used these as ratios to determine where my two bands of decoration were to go. Ingstad (last accessed July 2014) has detailed drawings, descriptions and analysis/discussion on the various finds from the Oseberg ship. Ingstad writes that fabrics have been found in at least 50 graves in Birka (Sweden) dated to the Viking age, probably of Norwegian origin. She also notes that similar silk fabrics were manufactured and used in Byzantium and the Middle-East in that period, which were sometimes cut up and used as decoration on otherwise plain clothing. Furthermore, silk strips are listed in the Oseberg finds. These particular silk strips had needle marks on both lengthwise sides and were likely attached to a wool fabric at some point (Ingstad, last accessed July 2014). Keeping this in mind, I extrapolated that it was feasible that the bands observed in the Valkyrie pendant could have been made from silk. As such, I appliquéd silk onto my Smokkr to make my bands. 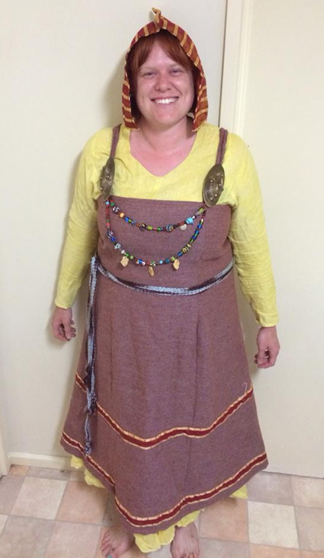 With this assistance of Her Majesty Liadan inghen Fheredaig, I strung up two strands of beads to wear. Two of the beads were a gift made by Master Sui, two of the beads were a gift from Her Majesty Liadan inghen Fheredaig, approximately four of the beads were tokens I received at Pennsic War 2013 for assisting with point command and the rest were beads I won in the early period raffle at GNW 2014. I borrowed turtle broaches from Lady Amelot de Akeney. The woven belt I wore was also won in the early period raffle at Great Northern War 2014. I had to wear my 16th century Mary Rose reproduction black leather shoes because they are the only period shoes I own. When I go to Pennsic 2015, I hope to be able to find and purchase some Norse-appropriate shoes to go with this outfit. For a quick and easy piece of headwear, I made a version of a silk Dublin hood (see Vanity Fairy, 2013) to wear for the event. The hood is not quite wide enough, however, I was restricted in its making by the amount of silk I had left after making the bands for my smokkr. Since making it, I’ve realised that it should also have a pair of ties at the front, and it was probably not appropriate headwear for the dress I was trying to create. According to information published about headwear and hairstyles by The Viking Answer Lady, it may be more appropriate for a Swedish Viking woman to wear knotted hair and a fillet rather than a hood (The Viking Answer Lady, last updated 2014). With a loose deadline of winter next year, I aim to add to this outfit. Anything from new headwear to making the pleated cloak and shawl are items I could add to improve it. 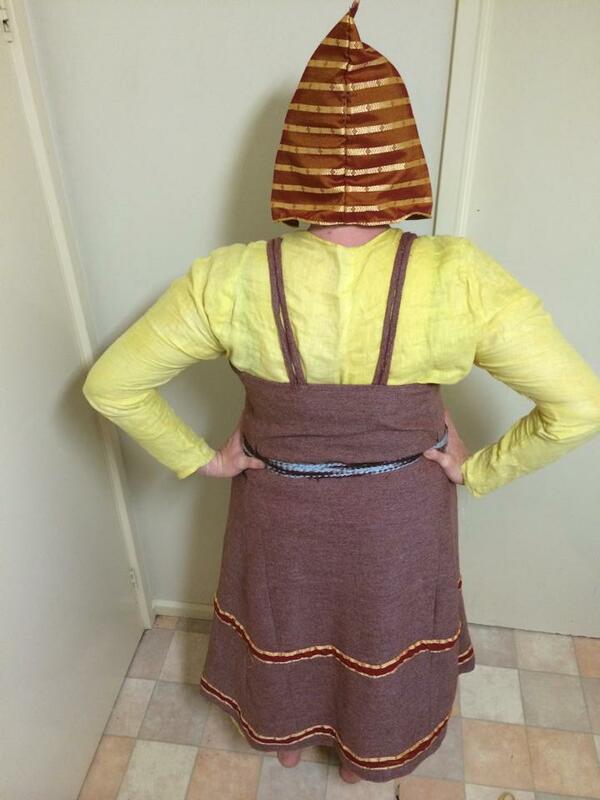 Figure 6: The Norse outfit I wore for Fields of Gold 2014 – back view. Ingstad, Anne Stine (last accessed December 2014). The textiles in the Oseberg ship.